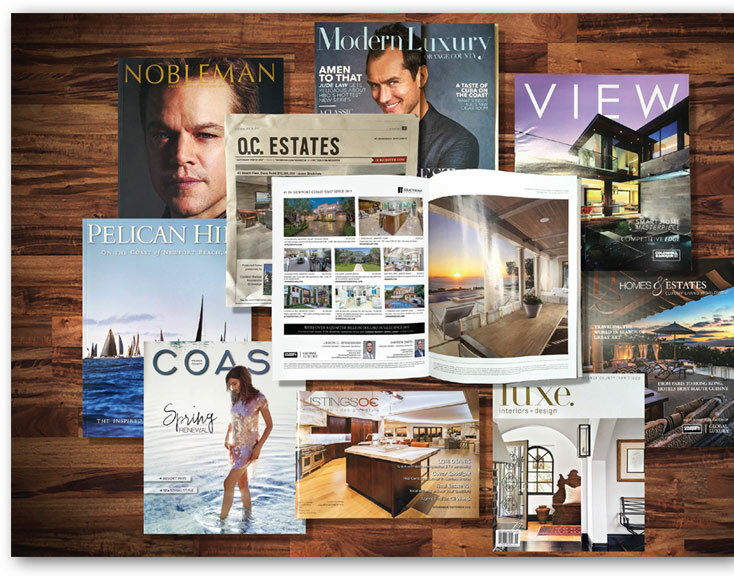 It takes a team with an unrivaled breadth of experience in the marketing and sale of high-value assets to be chosen by the most discerning clients in Southern California. We deliver your property to the world like no other real estate brokerage can. From vision to development of a highly customized marketing plan through the reality of a successful transaction, the Bradshaw Residential Group is attentive to every detail of your individual needs. At the Bradshaw Residential Group we are not only interested in the real estate transaction itself, we are interested in fully understanding our clients needs and lifestyles to successfully pair the new homeowner with their new home. Darren and Jason exceeded my expectations not only with the successful result of my sale but more importantly the ENTIRE PROCESS. They were present and 100% hands on with the detailed market preparation of my home, while appropriately positioning and marketing it, which had it sold in just 3 weeks after I had it formerly listed with another broker for 3 months... THANK YOU Bradshaw Residential Group- THAT'S how you do it. This is the SECOND Newport Coast home Jason and his team has successfully marketed and sold for our family. Given I am a broker myself I have MANY options to choose from and I continue to trust the Bradshaw Residential Group for many reasons. With their keen attention to detail from the very beginning including interior design, getting the home prepared to present to the market along with the staging, to the brilliant marketing they do, through the sales process of negotiations, contracts, and most importantly a smooth closing, I know I can count on the personal attention I receive from Jason, Darren and his team from start to finish. They are simply the best! We feel very fortunate to have Jason and Darren on board. They are hands on and very helpful in order to have a quick listing and a smooth closing so that we could have all of this done worry-lessly on the other side of world. The Bradshaw Residential Group were wonderful to us. As first time home buyers new to the area, they helped us to discover the neighborhood we ultimately fell in love with. They were constantly available to show us homes and answer questions thoughtfully. They gave us unswerving great advice and helped us negotiate successfully in a competitive marketplace. They also made the transaction process a breeze. The team are seasoned, knowledgeable, savvy, honest and patient too. I was proud to be represented by them and highly recommend them. Jason and Darren helped me in three real estate transactions. In each case they were professional, knowledgeable and responsive. In addition to being good negotiators, they are extremely helpful in interior design and marketing your home to it's full potential. Further, their team is great at making sure closings go through without a hitch. The Bradshaw Residential Group are FANTASTIC! Extremely knowledgable, HARD working, SMART, tough negotiators and GREAT work with. They sold our condo in the worst real estate market in 30 years AND held together an 11 month short sale escrow on the house we bought. This is a nightmare for ANY agent and Jason came through for us in spite of 3 cancelled buyer escrows, Countrywide Mortgage going bankrupt and transitioning to Bank of America, multiple liens on the property we were buying, etc. Jason is the best residential agent I've met... And I'm been commercial real estate broker for 30 years so I know what a GREAT agent is! Call him today whether you're buying or selling... You’ll be glad you did! J's the MAN, period! ... We met Jason 7 years ago when moving from NY and he made the transition for my family simple. His local knowledge of the entire Newport Coast was amazing. Since then we have bought and sold 3 other homes from Pelican Crest to Shady Canyon and now Corona del Mar. On our last sale, we authorized Jason to sell the home for $7.8MM and he got us $8MM! " I interviewed several top agents in Orange County and the Bradshaw Residential Group took the job of selling my home to another level. With his years of experience and his ability to explain his marketing approach to selling my luxury property, I knew he was the right man for the job. They knowledge of the luxury market and their ability to address my needs on the fly during the process has me NEVER going with another team for all my future real estate transactions. I highly recommend Jason and his team for any of your real estate needs. You won’t be disappointed. Jason, introduced us to the neighborhood eventually purchased and we love our new home. He negotiated a good price. And assisted us with every step of the way through escrow. I had the pleasure of working with Jason Bradshaw on a previous property and I had a wonderful experience working with Jason and that is why I came back to Jason on my recent purchase. Working with Jason on my new house made the buying process easy for me. He showed compassion as well as the commitment in making sure everything that I needed for my purchase happened without incident. His caring actions are an excellent example of how he worked with me to achieve my goal of homeownership. Jason was polite, knowledgeable and a great resource for me. Jason deserves to be commended for his excellent service. He stayed on top of every issue (and there were many along the way) and went above and beyond to make the entire process better for me by keeping me apprised along the way and telling me exactly what was needed for the next step. Jason is truly an example of "best in class service" and is a great asset to your company. I can say that today I am a proud homeowner of my dream property and thanks to Jason for making this dream come true. Jason represented us through an arduous purchasing process, which included several dry runs before we finally closed on an REO property. His command of the market, accessibility, and negotiating ability were top shelf. Thanks Jason! Jason is absolutely the smartest, most knowledgeable, lowest key broker we have ever dealt with. He has total integrity in his dealings with both sides of the transaction, and earned our respect and trust. He found our dream house for us, helped negotiate a fair price, assisted us with financing options, and guided us through the process til the end. His referrals and knowledge of the area were invaluable. We have referred several friends to Jason, and would turn to him in a heartbeat in looking for another home. We cannot recommend Jason highly enough. We sold and bought our new home with Bradshaw Residential Group. We worked with Jason for both transactions and were very pleased. They were incredibly responsive and professional. During our sale they provided their expertise on staging and showing the home leading to an above ask offer before the first open house. They were able to get us multiple offers and our home sold for well above asking. During our purchase, they helped us find the perfect home and negotiated a fantastic price (below asking). We cannot say enough good things about our experience and highly recommend Bradshaw Residential Group to anyone looking to buy or sell. Great agent! Fantastic sales team. Throughout process we truly felt that Jason's team, including his partner Darren and associates truly cater to providing convenience to their clients. They focused on your needs with realistic advice. Truly recommend their services for helping find or sell a new high end home in Newport Coast. I would have never sold my home so quickly or received top dollar if it wasn't for Jason and his team's keen attention to detail, period. Jason sold me my home 10 years ago and needless to say, styles have changed! They successfully executed their plan to get my home market-ready with an extensive cosmetic refresh to the house and yard, maximizing my profits while minimizing my days on market. They are true professionals who went far above and beyond what your typical REALTOR® would do! Thank you Bradshaw Residential Group for another great experience! Very pleased with Darren and Jason. They found me a buyer when my property (an ocean view lot for sale) hadn't even been put on the market yet, got a decent price for it, shepherded me through a very difficult transaction where close of escrow kept getting delayed due to unfortunate issues on my end, and kept on top of it throughout. They are quick to return texts, and all the paperwork got handled properly. They never bothered me with irrelevant properties when I was interested in something new, yet were very quick to help me when I wanted it, even with sometimes months of silence in between contact. Recommend them highly.